Globally, peatlands are under threat from a range of land use related factors that have a significant impact on the provision of ecosystem services, such as biodiversity and carbon (C) sequestration/storage. In Ireland, approximately 84% of raised bogs (a priority habitat listed in Annex I of the EU Habitats Directive) have been affected by peat extraction. While restoration implies the return of ecosystem services that were characteristic of the pre-disturbed ecosystem, achieving this goal is often a challenge in degraded peatlands as post-drainage conditions vary considerably between sites. Here, we present multi-year greenhouse gas (GHG) and vegetation dynamics data from two former raised bogs in Ireland that were drained and either industrially extracted (milled) or cut on the margins for domestic use and subsequently rewetted (with no further management). When upscaled to the ecosystem level, the rewetted nutrient poor domestic cutover peatland was a net sink of carbon dioxide (CO2) (−49 ± 66 g C m−2 yr−1) and a source of methane (CH4) (19.7 ± 5 g C m−2 yr−1), while the nutrient rich industrial cutaway was a net source of CO2(0.66 ± 168 g C m−2 yr−1) and CH4 (5.0 ± 2.2 g C m−2 yr−1). The rewetted domestic cutover site exhibited the expected range……. The aim of this study was to investigate the controls on carbon dioxide (CO2), methane (CH4) and nitrous oxide (N2O) dynamics on a blanket bog (at Pollagoona) and a raised bog (at Scohaboy) in Ireland after felling of plantation forestry and rewetting, and to produce annual balances for each gas at both sites. Gas fluxes were measured during a twelve-month period using the chamber method. Microsite types reflecting the dominant plant species at the chamber plots were identified and classified as Eriophorum-Sphagnum, Cladonia-Calluna and Molinia at Pollagoona and Eriophorum-Sphagnum, Cladonia-mosses, Eriophorum and brash (logging residues) at Scohaboy. The relationships between gas fluxes and environmental variables were assessed, and regression models were used to estimate annual CO2 and CH4 gas balances for each microsite type……. Renou-Wilson, F. and Wilson, D. (2018): VAPOR. EPA Research Report No 250, Environmental Protection Agency, Wexford, Ireland. Peatlands have played an important role in climate regulation over the past 10,000 years and the rewetting and restoration of peatlands has been demonstrated to offer considerable climate change mitigation opportunities. However, peatlands and organic soils in general are also vulnerable to climate change impacts and understanding and preparing for the effects of climate change – i.e. adaptation – is now seen as the overarching framework for conservation and land use management. The VAPOR project was established to inform a transition to a climate-resilient Ireland by providing science-based information on the vulnerability of peatlands to climate change, including extreme weather events. Long-term greenhouse gas monitoring studies over the last two decades have shown that Irish peatlands have been impacted by a wide range of environmental conditions. These studies provide robust greenhouse gas baseline data that can be used to better understand the effects of …. Renou-Wilson, F., Wilson, D., Rigney, C., Byrne, K., Farrell, C and Müller, C. (2017): NEROS. EPA Research Report No 236, Environmental Protection Agency, Wexford, Ireland. Natural peatlands are a high priority for biodiversity conservation, as species and habitats of international importance depend on the waterlogged conditions. Rewetting of drained peatlands and organic soils aims to return these conditions and set the system on a trajectory that will lead to biodiversity levels characteristic of natural peatlands. In addition, future land use of rewetted peatlands and organic soils should contribute to the reduction of greenhouse gas (GHG) emissions, being in line with not only climate change conventions but also sustainability demands…. Wilson, D., Farrell, C., Fallon, D., Moser, G., Muller, C. & Renou-Wilson, F. (2016) DOI: 10.1111/gcb.13325. Greenhouse gas emission factors associated with rewetting of organic soils. Wilson, D., Blain, D., Couwenberg, J., Evans, C.D., Murdiyarso, D., Page, S., Renou-Wilson, F., Rieley, J., Sirin, A., Strack, M. & Tuittila, E.-S. (2016), 17, Article 04, 1–28, http://www.mires-and-peat.net/, ISSN 1819-754X, doi: 10.19189/MaP.2016.OMB.222. To graze or not to graze: comparing 4 years GHG balances and vegetation from a temperate drained and a rewetted organic soil under grassland. 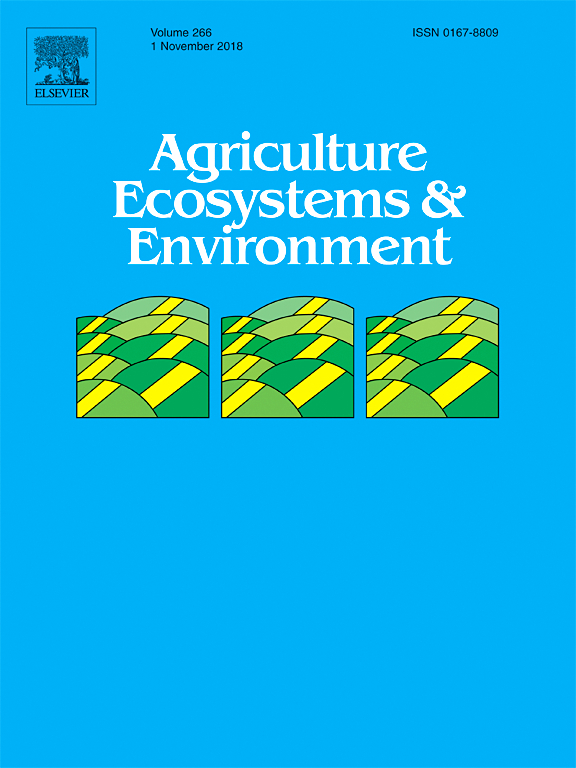 Renou-Wilson, F., Müller, C., Moser, G. and Wilson, D. (2016) Agriculture, Ecosystem and the Environment, http://dx.doi.org/10.1016/j.agee.2016.02.011(222), 156-170. Magnitude, form and bioavailability of fluvial carbon exports from Irish organic soils under pasture. Evans, C., Renou-Wilson,F. and Strack,M. (2015) Aquatic Sciences, doi: 10.1007/s00027-00015-00447-y. Laine, A. M., Wilson, D., Alm, J., Schneider, J. and Tuittila, E.-S.(2015) Journal of Vegetation Science, doi: 10.1111/jvs.12355, 2015. 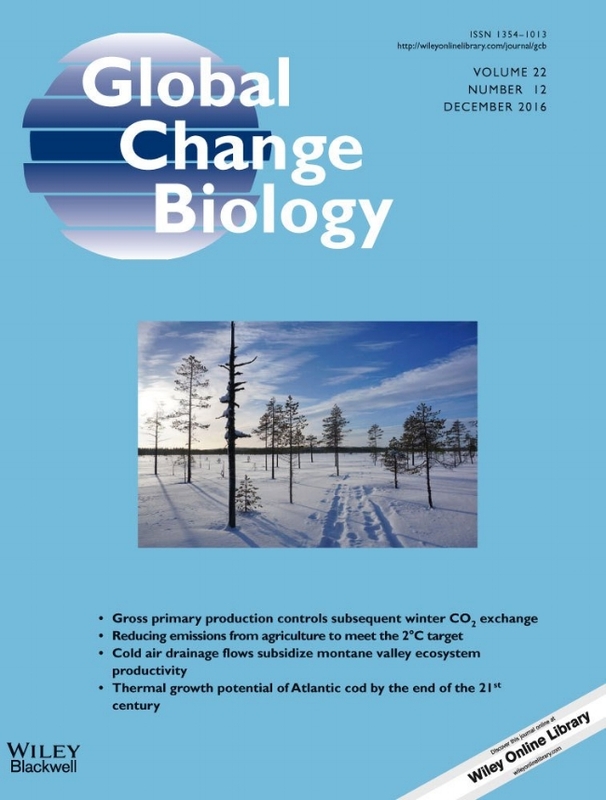 Measurements of ecosystem carbon (C) exchange are usually labour‐intensive and expensive. In peatlands, these temporally and spatially limited measurements are often up‐scaled over comparable ecosystems, such as ombrotrophic bogs, to provide an estimate for ecosystem level carbon dioxide (CO2) fluxes. Peatlands typically have moisture variations reflected in the presence of microforms (e.g. hummocks and hollows), each with characteristic plant life forms. However, so far the applicability of peatland type (e.g. bog, fen) or microforms for up‐scaling has not been assessed. Does the vegetation composition or function of associated species differ so greatly between the same types of peatland that up‐scaling is impossible?…..
Renou-Wilson, F., Wilson, D., Barry, C., Foy, B. and Müller, C. (2015): CALISTO. EPA Research Report No 141, Environmental Protection Agency, Wexford, Ireland. Temperate grasslands on organic soils are diverse due to edaphic properties but also because of regional management practices, and this heterogeneity is reflected in the wide range of greenhouse gas (GHG) flux values reported in the literature. In Ireland, most grasslands on organic soils were drained several decades ago and are managed as extensive pastures with little or no fertilisation. This study describes a two-year study of the net ecosystem carbon balance (NECB) of two such sites and aims to deliver data to allow the Republic of Ireland (ROI) to progress towards a higher-tier reporting level for this land use category (LUC). 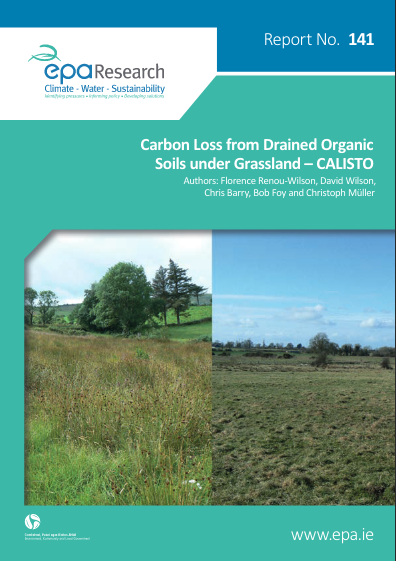 It also provides a comprehensive overview of carbon (C) dynamics in organic soils by investigating all potential C imports and exports, including fluvial C loss…. Wilson, D., Dixon, S.D., Artz, R.R.E, Smith, T.E.L., Evans, C.D., Owens, H.J.F., Archer, E. and Renou-Wilson, F. (2015), Biogeosciences 12:5291-5308. Renou-Wilson, F. Barry, C., Müller, C. Wilson, D. (2014). Biogeosciences , 11:4289-4379. Guidelines for National Greenhouse Gas Inventories: Wetlands. Blain, D., Murdiyarso, D., Couwenberg, J., Nagata, O., Renou-Wilson, F., Sirin, A., Strack, M., Tuittila, E. S., and Wilson, D. (2014) 'Rewetted organic soils' In: Hiraishi, T., Krug, T., Tanabe, K., Srivastava, N., Baasansuren, J., Fukuda, M., and Troxler, T. G (eds). 2013 Supplement to the 2006 IPCC Switzerland: Intergovernmental Panel on Climate Change. 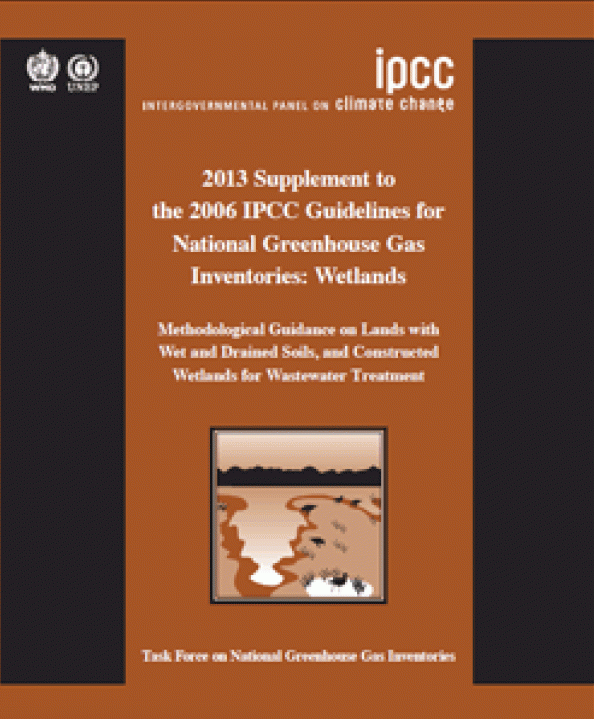 The 2013 Supplement to the 2006 IPCC Guidelines for National Greenhouse Gas Inventories: Wetlands (Wetlands Supplement) extends the content of the 2006 IPCC Guidelines by filling gaps in coverage and providing updated information reflecting scientific advances, including updating emission factors. It covers inland organic soils and wetlands on mineral soils, coastal wetlands including mangrove forests, tidal marshes and seagrass meadows and constructed wetlands for wastewater treatment. The coverage of the 2006 IPCC Guidelines on wetlands was restricted to peatlands drained and managed for peat extraction, conversion to flooded lands, and limited guidance for drained organic soils. Wilson, D. Müller, C. and F. Renou-Wilson. (2013). Irish Geography, 46(1-2): 1-23. In the Republic of Ireland, peatlands cover an estimated 20% of the land area and have been widely utilised over the centuries for energy production, agriculture, forestry and horticultural production. Current estimates suggest that only a small proportion of Irish peatlands are in a natural condition, and that the remainder are either moderately or severely damaged. In this paper, we reviewed carbon (C) studies for the major peatland land uses in Ireland and have estimated that at the national level, emissions from Irish peatlands and related activities (e.g. combustion, horticulture) are around 3 Mt C each year to the atmosphere. However, large uncertainties are associated with this value (1.3–4.7 Mt C yr−1) due to a paucity of field studies for some peatland land uses (particularly cutover peatlands)…. Wilson, D., C. Farrell, C. Müller and F. Renou-Wilson (2013) 'Rewetted industrial cutaway peatlands in western Ireland: a prime location for climate change mitigation'. Mires and Peat, 11 (Article 01):1-22. Wilson, D., Renou-Wilson F., Farrell, C., Bullock, C. and C. Müller. (2012). Carbon Restore—The Potential of Restored Irish Peatlands for Carbon Uptake and Storage. Climate Change Research Programme (CCRO) 2007-2013 Report Series No 15. Environmental Protection Agency, Johnstown Castle, Co. Wexford. 32 pp. Renou-Wilson F., Bolger T., Bullock C., Convery F., Curry J. P., Ward S., Wilson D. & Müller C. 2011. BOGLAND: Sustainable Management of Irish Peatlands. STRIVE Report No 75 prepared for the Environmental Protection Agency, Johnstown Castle, Co. Wexford. 157 pp. Renou-Wilson F., Bolger T., Bullock C., Convery F., Curry J. P., Ward S., Wilson D. & Müller C. (2011). A Protocol for the Sustainable Management of Irish Peatlands. STRIVE Report No 76 prepared for the Environmental Protection Agency, Johnstown Castle, Co. Wexford. 24 pp. Renou-Wilson, F., M. Pöllanen, K. Byrne, D. Wilson and E.P. Farrell. (2010). The potential of birch afforestation as an after-use option for industrial cutaway peatlands. SUO, 61 (3-4): 59-76. Wilson, D., J. Alm, J. Laine, K. A. Byrne, E. P. Farrell, and E.-S. Tuittila (2009). Rewetting of cutaway peatlands: Are we re-creating hotpots of methane emissions? 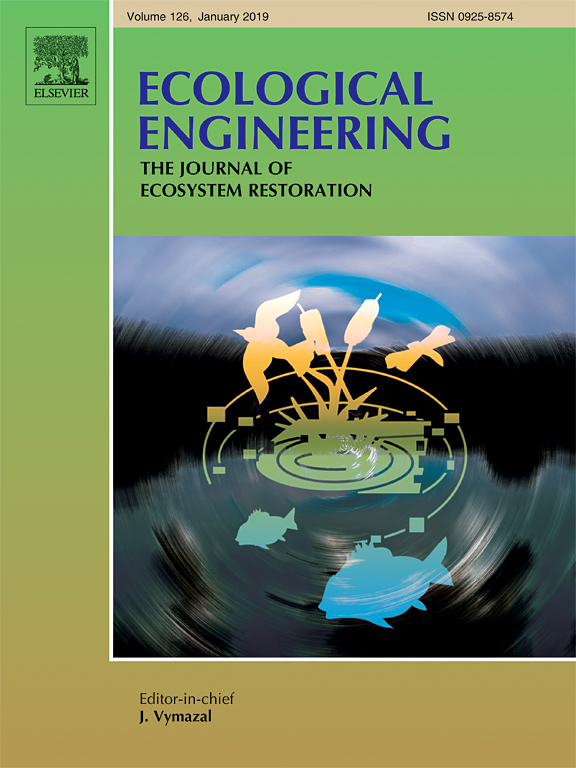 Restoration Ecology 17:796-806. Renou-Wilson, F. and C.A. Farrell. (2009). Peatland vulnerability to energy-related developments from climate change policy in Ireland: the case of wind farms.Mires and Peatlands, 4 (Article 08):1-11. Renou-Wilson, F., M. Keane and E.P. Farrell. 2009. Afforestation of industrial cutaway peatlands in the Irish midlands: site selection and species performance. Irish Forestry, 66: 85-100. Wilson, D. (2009). Death by a thousand cuts – Peatlands in Ireland. The Irish Times (Weekend Review), January 24th Dublin. Feehan, J., G. O'Donovan, F. Renou-Wilson and D. Wilson (Ed.). (2008) The bogs of Ireland: An introduction to the natural, cultural and industrial heritage of Irish peatlands. University College Dublin, Ireland. Renou-Wilson, F., M. Keane, G. McNally, J. O'Sullivan, J. and E.P. Farrell. 2008. BOGFOR: A research programme to develop a forest resource on industrial cutaway peatlands in the Irish midlands. COFORD, Dublin. Renou-Wilson, F., M. Keane and E.P. Farrell. (2008). Establishing oak woodland on cutaway peatlands: Effects of soil preparation and fertilization. Forest Ecology and Management, 255 (3-4):728-737. Renou-Wilson, F. M. Keane and E.P. Farrell. 2008. Effect of stocktype and cultivation treatment on the survival morphology and physiology of Norway spruce on cutaway peatlands. New Forests, 36 (3):307-330. Wilson, D., J. Alm, T. Riutta, J. Laine, K. A. Byrne, E. P. Farrell and E.-S. Tuittila. (2007). A high resolution green area index for modelling the seasonal dynamics of CO2 exchange in vascular plant peatland communities. Plant Ecology. 190: 37-51. Laine, A., D. Wilson, G. Kiely, and K. A. Byrne (2007). Methane flux dynamics in an Irish lowland blanket bog. Plant and Soil: 299(1): 181-193. Wilson, D and E.P. Farrell. (eds) (2007). CARBAL. Carbon gas balances in industrial cutaway peatlands in Ireland. Final Report. Bord na Móna. Wilson, D., E.-S. Tuittila, J. Alm, J. Laine, E. P. Farrell and K. A. Byrne. (2007). Carbon dioxide dynamics of a restored maritime peatland. Ecoscience 14: 71-80. Renou-Wilson, F. and E.P. Farrell. (2007). The use of foliar and soil information for optimising the nutrition of Sitka spruce and Norway spruce on cutaway peatlands. Silva Fennica, 41 (3):409-424. Renou, F., M. Keane, U. Scallan, and E.P. Farrell. 2007. Establishment of native birch on cutaway peatlands in Ireland: silvicultural practices. European Journal of Forest Research, 126 (4):545-554. Renou-Wilson, F. and E.P. Farrell. 2007. Phosphorus in surface runoff and soil water following fertilization of afforested cutaway peatlands. Boreal Environment Research, 12 (6):693-709. Laine, A., M. Sottocornola, G. Kiely, K. A. Byrne, D. Wilson and E.-S. Tuittila. (2006). Estimating net ecosystem exchange in a patterned ecosystem: Example from blanket bog. Agricultural and Forest Meteorology 138: 231-243. Wilson, D. (2006). Climate change, C and Irish peatlands Pages 56-59. In C. A. Farrell, editor. 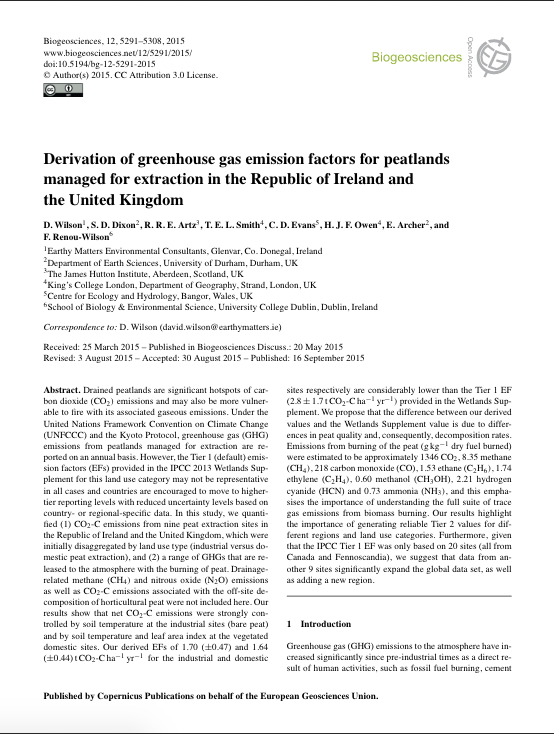 Peatland utilisation and research in Ireland 2006. Proceedings of the 1st seminar of the Irish National Committee of the International Peat Society. Dublin, Ireland, October 10th 2006. Irish Peat Society. Renou, F. and E.P. Farrell. (2005). Reclaiming peatlands for forestry: the Irish Experience. In J.A. Stanturf and P.A. Madesen (eds) Restoration of Boreal and Temperate Forests, CRC Press, Boca Raton, pp 541-557.